Aston Martin Red Bull Racing Special Edition. 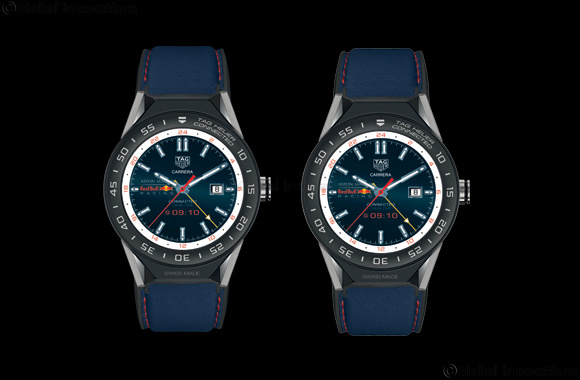 Dubai, UAE, April 8, 2018: To mark the launch of the Formula One season on March 25th in Melbourne, Australia, and to celebrate the partnership’s third year, TAG Heuer developed a special edition of its TAG Heuer Connected Modular 45. With its bold 45 mm diameter, the connected watch bears the team's colours, midnight blue and red, a combination which naturally suggests a racing spirit. TAG Heuer dials. Google’s Android Wear 4.4+ or iOS 9+ and the new TAG Heuer Companion app improve the software experience and keep you connected with the people and information that you care about most. TAG Heuer is the Official Timekeeper, Official Watch and Team Performance Partner of Aston Martin Red Bull Racing Formula One Team, and since 2016 has been the official engine naming Partner of the team, with the Aston Martin Red Bull Racing car for the current season being officially named the Aston Martin Red Bull Racing-TAG Heuer RB14. It was the team's atypical approach to sport, performance and entertainment which appealed to TAG Heuer and which continues to be perfectly in line with the avant-garde Swiss watch brand's marketing strategy. TAG Heuer takes the opportunity to wish all the best to the Aston Martin Red Bull Racing Formula One Team for the coming season!